Featuring the full Two Ronnies Christmas Specials from 1982, 1984 and 1987 as well as the 1973 Old Fashioned Christmas Mystery and their appearance in the 1972 Christmas Night with the Stars. Throughout the 1970s and 1980s, Ronnie Barker and Ronnie Corbett's magnificent partnership became a cherished British institution. Their Christmas Specials were particularly eagerly awaited and, for many, they were the highlight of the festive tele..
Own The Two Ronnies Series 1 to 12 Complete Collection DVD from Deff, DVD, Blu-Ray & 4K Video Specialists - Free UK Delivery..
Own The Two Ronnies Series 1 DVD from Deff, DVD, Blu-Ray & 4K Video Specialists - Free UK Delivery.. The classic BBC Comedy series starring Ronnie Barker and Ronnie Corbett. Ronnie Barker and Ronnie Corbett were a comedy team whose talents complemented each other perfectly in a series that would run for 16 years and become part of British television history. From their introduction, "And in a packed programme tonight..." to the "Goodnight from him", viewers would savour the familiar features - the news items, sharp dialogue sketches, R.. The classic BBC Comedy series starring Ronnie Barker and Ronnie Corbett. Ronnie Barker and Ronnie Corbett were a comedy team whose talents complemented each other perfectly in a series that would run for 16 years and become part of British television history. 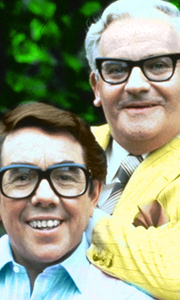 From their introduction, "And in a packed programme tonight..." to the "Goodnight from him", viewers would savour the familiar features - the news items, party, doctor, tramp and y..
Ronnie Barker and Ronnie Corbett were a comedy team whose talents complemented each other perfectly in a series that would run for 16 years and become part of British television history. From their introduction, "And in a packed programme tonight..." to the "Goodnight from him", viewers would savour the familiar features - the news items, party, doctor, tramp and yokel sketches, Ronnie Barker's speeches and the rambling monologues from ..
Own The Two Ronnies Series 2 DVD from Deff, DVD, Blu-Ray & 4K Video Specialists - Free UK Delivery..
Own The Two Ronnies Series 3 DVD from Deff, DVD, Blu-Ray & 4K Video Specialists - Free UK Delivery.. The classic BBC Comedy series starring Ronnie Barker and Ronnie Corbett. Ronnie Barker and Ronnie Corbett were an unlikely comedy team but their talents complemented each other perfectly in a series which would run for 16 years and become part of British television history. From their introduction, "And in a packed programme tonight..." to the “Goodnight from him”, viewers would savour the familiar features – the opening and closing new.. The classic BBC Comedy series starring Ronnie Barker and Ronnie Corbett. Ronnie Barker and Ronnie Corbett were an unlikely comedy team but their talents complemented each other perfectly in a series which would run for 16 years and become part of British television history. From their introduction, "And in a packed programme tonight..." to the "Goodnight from him", viewers would savour the familiar features - the opening and closing new..
Own The Two Ronnies Series 6 DVD from Deff, DVD, Blu-Ray & 4K Video Specialists - Free UK Delivery.. The classic BBC comedy series starring Ronnie Barker and Ronnie Corbett. Ronnie Barker and Ronnie Corbett were a comedy team buwhose talents complemented each other perfectly in a series that would run for 16 years and became a part of British television history. From their introduction, "And in a packed programme tonight..." to the "Goodnight from him", viewers would savour the familiar features - the news items, party and doctor sketc.. The classic BBC Comedy series starring Ronnie Barker and Ronnie Corbett. Ronnie Barker and Ronnie Corbett were a comedy team whose talents complemented each other perfectly in a series that would run for 16 years and become part of British television history. From their introduction, "And in a packed programme tonight..." to the "Goodnight from him", viewers would savour the familiar features - the news items, party and doctor sketches,..
Own The Two Ronnies Series 9 DVD from Deff, DVD, Blu-Ray & 4K Video Specialists - Free UK Delivery..